Narrating the Syria logjam, Saudi Arabia and Russia believe a political settlement in the war-ravaged country is dead in the water. President Bashar al-Assad’s actions make negotiations impossible, Saudi Foreign Minister Prince Saud al-Faisal told a news conference in Riyadh last night. Russian Foreign Minister Sergei Lavrov retorted at an annual news conference in Moscow this morning there could be no peace so long as Assad’s opponents refuse to negotiate with his administration and demand his exit from power as a precondition for peace talks. “Damascus... which has been a city for the longest period of time, is carpet-bombed. How can you conceive of the possibility of a negotiated settlement with somebody who does that to his own country, to his own history, to his own people? It is inconceivable to us,” Prince Saud told reporters in Riyadh. Prince Saud said the UN Security Council needed to take urgent action to end the crisis. “We have a call to make to the Security Council, to finally show the responsibility that they must show... or otherwise I think it is the duty of the General Assembly to censure the Security Council for failing in its duty,” he added. “Our priority is not reaching some kind of a geopolitical goal, which ousting the existing regime definitely is,” he said. Speaking of naval war games Russia is holding in the Black Sea and in the Mediterranean, not far from Syria, Lavrov said the naval presence was a positive factor. "Of course we have no interest in the Mediterranean region becoming even more destabilized. And the presence of our fleet there is undoubtedly a stabilizing factor," Lavrov said. He also said Moscow was not beginning a mass evacuation of its citizens from Syria. Lavrov was speaking a few hours after a total of 77 Russian citizens, mostly women and children, were flown back to Moscow from Beirut after fleeing Syria by land as the security situation in the war-torn country continues to deteriorate. The evacuees were bused to Beirut and flown home from there because of persistent fighting near Damascus airport. "We have plans (for an evacuation), as we have plans for any country, in case of an escalation of the internal situation... but there is no talk of implementing them," Lavrov said. But if Russian citizens decide to leave the country, Russian Emergencies Ministry jets can fly them back to Russia since they deliver humanitarian help to Syria regularly, he added. Lavrov said Russia had pulled out the families of diplomats but there were no immediate plans to reduce embassy staff -- and Russia's embassy in Damascus was functioning normally. The embassy told RIA Novosti 8,008 Russian nationals are registered in its official lists, but diplomatic sources estimate about 25,000 more Russian women married to Syrians live in the country without registering at Russian consular services. RIA Novosti said the first group of 28 evacuees was delivered by a Yak-42 passenger plane, followed by a larger group of 49 Russian nationals transported by an Il-76 aircraft. The planes landed at Moscow’s Domodedovo airport where medical personnel, psychologists and immigration officials met the passengers. 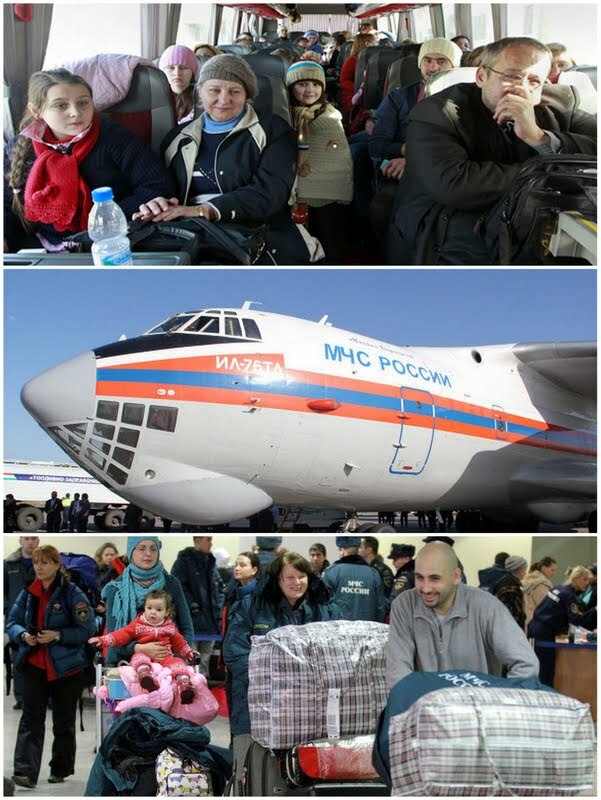 The evacuees include Russian women who married Syrians, their children and husbands who acquired Russian citizenship. "It's very dangerous there. Rockets, planes, tanks," one man named as Albert Omar, told state TV. A Russian woman, who was not named, said: "It had become impossible to live there. There is no money. No work. We have lost everything."